From left: Ian Magner, Brooke Morabito and Katie Delaney signed their National Letters of Intent on Monday. NEW MILFORD — With snow melting and spring around the horizon, the high-school calendar is coming close to winding down. So are the careers of many athletes who have spent years honing their skills that will end with the final pitch, putt or goal in the next several months. For three select standouts at New Milford High that journey will continue when graduation commences in June. 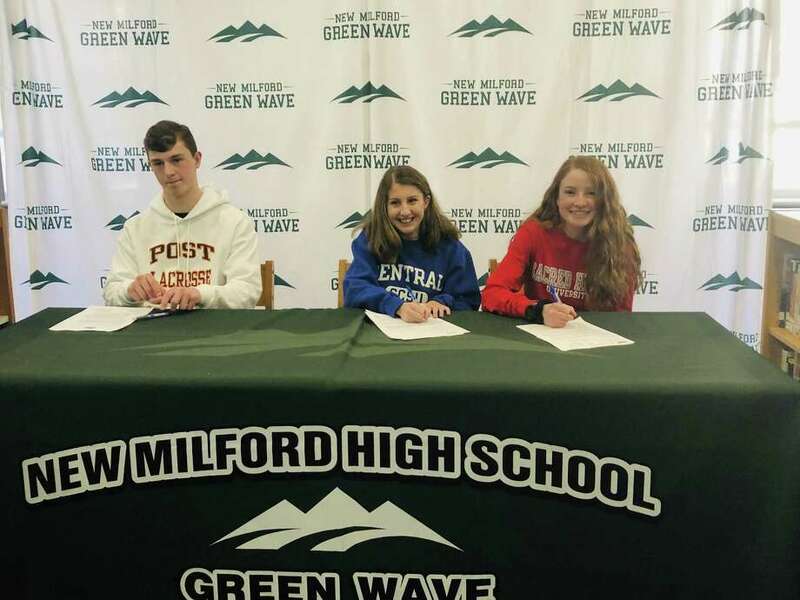 Ian Magner (Post), Brook Morabito (Central Connecticut) and Katie Delaney (Sacred Heart) were joined by family and friends Monday as they signed their National Letters of Intent. All three are staying remarkably close to home to add another chapter to their athletic and academic endeavors. Magner joins a Post men’s lacrosse program which began varsity competition in 2014. Magner is a defenseman who helped the Green Wave reach the Class L state tournament last year. “It's pretty important because you work so hard to be able to one of the top people in your class for athletics,” Magner said. Morabito and Delaney helped form a formidable cross country team that placed third at SWCs, third in Class L and eighth at the State Open. Morabito scored a big win during the indoor track season, claiming the SWC title in the 3,200. Both will have local teammates as Kayla Cohen (New Fairfield) is headed to Central while Cassandra Sturdevant (Danbury) will attend Sacred Heart.